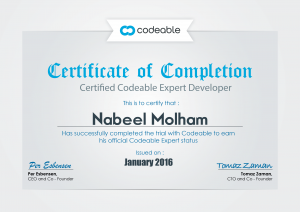 My name is Nabeel Molham, a freelance web developer, WordPress Specialist. I worked with few companies inside and outside Egypt, and I all started at the end of 2003 with Macromedia Flash 5.0 :D.
Assessed to be suitable for migration under 261212 (Web Developer) of the ANZSCO Code. Maintaining, developing, and improving their line of well-known WooCommerce extension products. WordPress development is the best thing I like to do, themes, plugins and deep integrations, also working on other platforms and front-end development. Working at Eprisma as a Senior at first then a Development team leader, and I was incharge of company products and other web projects development and mobile API integrations. Rich Internet Application development with Adobe Flash, Adobe Flash Builder "was known as Adobe Flex", ActionScript 3.0 and MXML. "I am very happy with Nabeel's work. My company presented him with a multi faceted coding challenge for our Woo Commerce powered - membership supported - WordPress site that he handled flawlessly. From the very first communication with Nabeel, I could tell that I hired the right person for our project, he asked all of the right questions and offered great solutions to the problems we presented him. All of his work was done on time and was done correctly. Since then we have asked for a few minor additions which he has executed very quickly. If you have a WordPress based site and you need some advanced customization done, Nabeel is the go to person. We will definitely call on him for all of our coding needs going forward." "Genuinely cares about my website and my success. That's why Nabeel has been my first pick for over two years now"
"Excellent service! Nabeel really cares about the success of my company and it shows in his work and dedication"
"We always, and I mean always, request Nabeel when we need anything done with our custom WordPress themes. He is super talented, experienced and a pleasure to work with. 🙌"
"Amazing work, quick reply and super kind. I recommend to work with Nabeel always and will work with him for all my future projects." "Nabeel is great, he answered all of our questions and made great suggestions, which will enable a wonderful finished product. Looking forward to working with him." 4.97 / 5 overall rating so far.